Next: My favorite pie– bourbon, chocolate, & pecans, oh my! Have you ever had the Gooey Cake dessert at The Hamilton in downtown DC? If you have, you’re as excited as I am right now. If you haven’t, I recommend trying it PRONTO!! It’s basically a bowl of warm, gooey cake-batter-like cake swimming in a chocolate sauce pool, topped with cookie crumbs and ice cream. Omg. I want it again. It’s one of those desserts that’s 1000% worth getting at a restaurant, even if you’re pretty full from dinner. I do want to re-create that dessert sometime. But, for now, it inspired me to make a cookie that tastes like soft gooey cake batter bursting with chocolate. 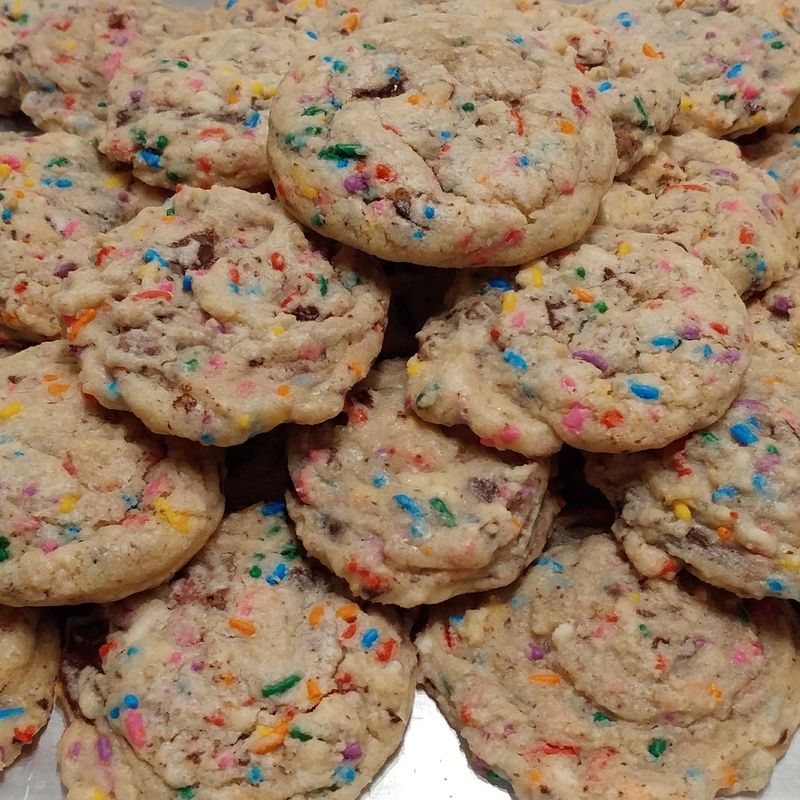 Enter: homemade cake batter chocolate chunk cookies. I say homemade because I mean from scratch– there’s no bag-of-cake-mix in here. There are lots of cake batter cookies out there that do use the bag of cake mix you get at the store, and don’t get me wrong, they’re delicious, but I wanted to make a from-scratch version. The secret, key ingredient here is the almond extract. It adds that cake-batter-esque flavor that is so hard to pinpoint when you’re eating a funfetti cupcake or a… cake-batter-flavored-anything. In a small bowl, whisk together the flour, baking soda, salt, and cornstarch. Set aside. In the bowl of a stand mixer (or a large bowl with an electric mixer) beat together the butter and sugar. Mix them on a medium-high speed for a goood 5 minutes, stopping to scrape the sides of the bowl as needed. You’ll have a creamy, pale-colored mixture. Add in the eggs, vanilla extract, and almond extract and beat again on a medium speed until fully incorporated. With the mixture on the lowest speed, slowly add in the flour mixture a little bit at a time, giving it time to incorporate. Doing this slowly will help prevent the flour from poofing into the air. When the flour is almost fully incorporated, add in the sprinkles and chocolate chunks. Mix just until combined. Remove the bowl from the stand mixer. Stir the dough with a wooden spoon if needed to finish incorporating the sprinkles and chocolate (you just want to make sure not to over-stir, or else you’ll end up with tough cookies). Line a baking sheet with a silpat mat or parchment paper. Using two spoons or a cookie scoop, scoop the cookie dough onto the cookie sheet, leaving about an inch between each cookie dough ball. Bake in the preheated oven for about 8 minutes. You want to take them out before they start to turn brown to ensure soft, gooey (but cooked) cookies. They’ll bake a smidge more on the baking sheet still after you remove them from the oven. Allow the cookies to cool on the baking sheet for a few minutes. Then, using a spatula, remove them from the baking sheet onto wire cooling racks (or plates–something that is not hot). Repeat the cookie-dough-baking steps until you’ve baked all the dough! Per always, I recommend trying 10 one warm. Nothing beats a warm, soft cookie fresh from the oven! Go ahead and serve the cookies, or, if you’re saving them for later, wait for them to cool completely and then store them in an airtight container. I have never used cornstarch in my cookies. So interesting (seriously it’s weird but it fascinates me). What does the cornstarch do? Add a little thickness to the batter? I apologize for the delay!! Yes, you’re right! The cornstarch adds a thickness, or more technically, it makes the baked goods more tender 🙂 I’ll do a side-by-side recipe test of 1 version with the cornstarch and 1 without. It’s a subtle difference, but a great one! Where did your blog posts go?!? !